The Cave Pit- at 2 months old was all skin and bones when his previous owners gave him away. He had Parvo and weighed 9 pounds; you could see all his bones from his shoulders to his hips. When I met him for the first time he wobbled over to me, almost toppling over from the weight of his big head. All I could think of when I looked at him was all the bones sticking out, so I named him Bones. I fell in love, took him home, and nurtured him back to health. Like a cave beast, he started to eat all his food in one breath and under 30 seconds. Eighteen months later, Bones is a healthy 65 pounds and he is a model pit-bull who quickly learns tricks like high-five, turn around, hop, and a high-five up high on his hind legs! Bones is dressed as a cave-dog because of his beastly appetite. He gets very excited when it’s time for treats and he plays with his treats like a cave-dog would. Not only does he have a pre-historic appetite, when he’s not eating… he’s sleeping! Watch out for this pit, if you move your meat you’re gonna lose your seat! He loves to keep your spot on the couch warm and he snores louder than a freight train! Bones deserves your vote because he is a survivor! He is lovable, disciplined, and loves to have his picture taken. I am so happy to have him in my life and I hope you enjoy his cute face! What a sad but great story, i am so glad you found Bones & saved him. I too, think he should have won first place, not just because of the cutest outfit, but because of a very touching story. I know i'm a few months behind on this but just came back to this site for the first time in a while. He is such a handsome boy & i am so happy to hear of someone who cared enough about him to nurse him back to health. He looks like a really wonderful dog. Give him a big hug & lots of kisses from a fellow dog lover (who has my first pit mix dog (look up Angel from WI if you want to see her.) You are #1 in my book for caring enough to give him a 2nd chance at life, which, he prob wouldn't have if it weren't for you. I think he should have won 1st place! Talk about adorable & a really great story, as if you wouldn't have found him, he probably wouldn't have made it. I suppose he was so hungry that he'll never get over that fear of wondering whether food will always be there, hence, the voracious appetite. He sounds like a wonderful, sweet dog & I'm glad he found a great home with you. He has my vote anytime! LOl how cute!!! I bet you live in Lancaster or Palmdale some where where its hot hes got lots of dinosaur bones to play with. Yay what a great pibble. TERROR TERROR IN THE NIGHT.. A BONES WILL LICK YOU WITH ALL HIS MIGHT..
Bones is getting Sooo big!! Beautiful. The cats miss bones. Hahaha!! 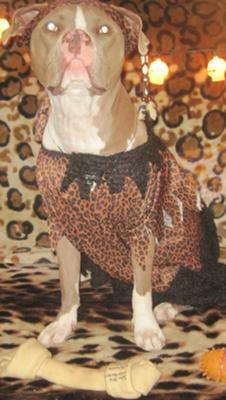 Bam Bam ain't got nutun on this Cave Dog. Bone's is definately King of his cave, and behind every King there's a great Queen! Outstanding specimen of woman's best friend. beautiful dog. so happy you saved him! He's so cute and I love your story. How cute!I love to hear stories like this. I hope Bones wins! This picture of her is so beautiful!!! 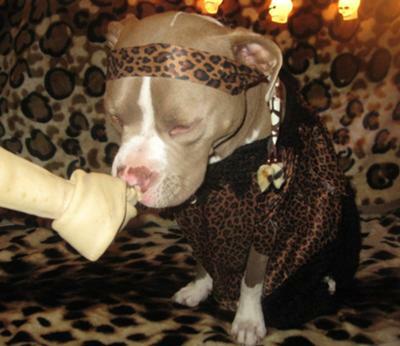 I love her playing w/ the bone too! Truly great what this person has done for this dog. Love the pictures! Pits can be great dogs and I am so glad to hear that you rescued him! Wow Reyna! You've done a great job with this dog. He deserves to win for sure. Bones is such a precious sweetheart. Sooo..much character and so loveable. Hands (or paws) down; he is the best! Cave Dog Bones is the bomb. five stars for me. Reminds me of my dog. Go Cave Dog Go! I see what you are driving at here. My boy was under weight as well when we first took him in. He looked like a bobble-head... and the way he would scarf down his food was so sad. He often had to fight for his food and we also discovered on the second day he was with us that he had worms :( No wonder the poor boy was so hungry! But almost a year later, he's almost 70 lbs and occasionally skips a meal... just because he can. We always feed him his cup and a half two times a day, but sometimes he just decides he's good for whatever reason and chooses to skip a meal. What a difference a year makes! 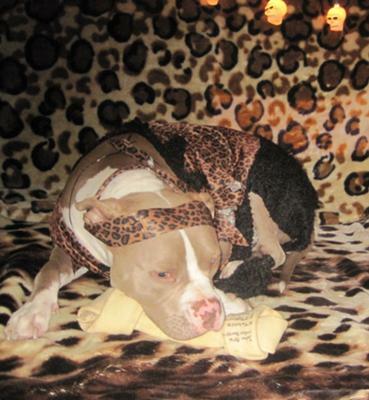 Love the story, love the outfit... Good Luck Bones! Woof woof, I'm a badass hippy.